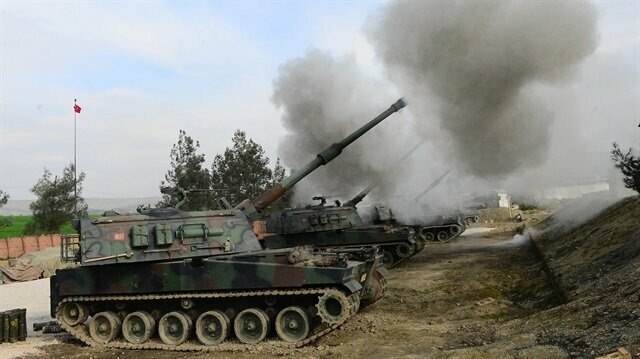 Turkish and Free Syrian Army (FSA) forces liberated another northwestern Syrian village from PYD/PKK terrorists on Tuesday, according to Anadolu Agency correspondents on the ground. Operation Olive Branch cleared PYD/PKK terrorists from the village of Omar Simo in Afrin, Syria. Including Omar Simo, to date Turkish forces and the FSA have liberated a total of 52 zones, including 34 villages and 14 strategic mountains or hills. In Turkey's Hatay province, military vehicles are being transported to border units as Turkish Armed Forces strike PYD/PKK terror group targets within the scope of 'Operation Olive Branch' launched in Syria's Afrin. The operation is being carried out under the framework of Turkey’s rights based on international law, UN Security Council resolutions, its self-defense rights under the UN charter, and respect for Syria's territorial integrity, the military said. The military has also said that only terrorist targets are being destroyed and "utmost care" is being taken to avoid harming civilians. Afrin has been a major hideout for the PYD/PKK since July 2012 when the Assad regime in Syria left the city to the terror group without a fight. Over 65 people were arrested as part of PKK/KCK counter-terrorism raids across Turkey, police sources said on Tuesday.In a statement, the Van Provincial Security Directorate said police carried out simultaneous operations in the province to apprehend 20 PKK/KCK suspects. 18 of them were arrested as part of the raids.According to the statement, the suspects were planning to hold street demonstrations to protest both the anniversary of the 1999 arrest of Abdullah Ocalan, the convicted leader of the terrorist organization PKK, and the ongoing Turkish-led Operation Olive Branch in northwestern Syria.Over 1,400 terrorists neutralized in Afrin operationThe PKK -- recognized as a terrorist group by the U.S., the EU, and Turkey -- is responsible for the deaths of more than 1,200 Turkish security personnel and civilians, including women and children, since July 2015 alone.Police also rounded up 17 suspects in the northwestern Balikesir province for allegedly spreading terror propaganda on social media against Operation Olive Branch, the governorship said on Tuesday.Hunt for four people are ongoing, it added.Another 17 suspects -- including opposition People’s Democratic Party’s (HDP) provincial heads and members -- were arrested in southern Hatay province for allegedly promoting PYD/PKK/KCK/YPG propaganda. The suspects were also allegedly trying to defame ongoing Turkish-led Operation Olive Branch in northwestern Syrian region of Afrin, a police source said.Counter-terrorism raids also saw 11 suspects arrested in eastern Malatya province on Tuesday.The suspects were spreading propaganda of PKK/KCK terror group, attending funerals of terrorists, holding press briefings and attending marches, said the police source, who asked not to be named due to restrictions on speaking to the media.In central province of Kayseri, 6 suspects were arrested for allegedly spreading PYD/PKK terror group’s propaganda, another police source said.